Orane Barrett ’98 is proud to tell you that he’s a nerd. He likes being around other nerds, too. Not just in the dual worlds he’s inhabited of engineering and finance, but across fields. As a cultural icon, the nerd is experiencing a heyday. In a world in which rewards increasingly flow to people with highly specialized skills and expertise, that’s not surprising. But if adults know just how powerful nerds can be, it’s a message that doesn’t always get through to kids. For that to happen, Barrett says, the nerd’s signature qualities—qualities he boils down to “hard work, intelligence, and passion”—have to be recast as cool. In December, Barrett left his job as a project manager at Credit Suisse to devote himself full time to his apparel start-up, Kool Nerd Clothing. Rest assured, that as a bona fide nerd, Barrett can spell; kool, he says, is an acronym for “knowledge out of learning.” The aim of the business is to manufacture and sell clothing that will function as “a billboard and a conversation piece” he says, for the idea that intelligence and hard work are cool. Barrett is a social entrepreneur. 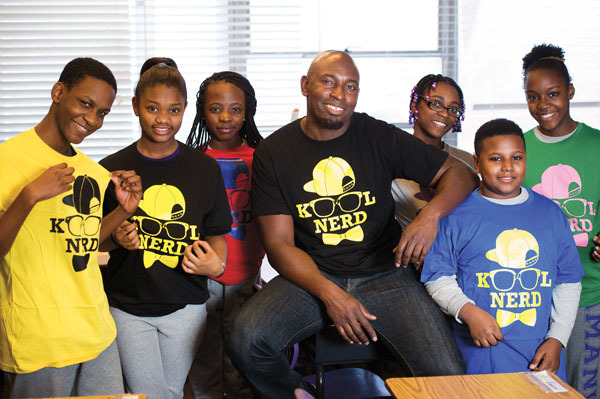 Kool Nerds aims to donate a portion of proceeds and in-kind support to programs that support “STEAM”—science, technology, engineering, arts, and math—education. His target market—kids in urban public schools—will be tough to penetrate. But he knows their world well. Barrett was 10 when he moved with his family from Jamaica to the United States. Settling into the Brooklyn neighborhood of Flatbush, the language was familiar, but the culture wasn’t. “In the Caribbean, education is number one, and it’s pushed very hard by the parents,” he says. At his school in Brooklyn, “if a child was known as intelligent, it wasn’t looked upon in a positive way.” Kids who wore their intellect on their sleeves could be beaten up, or worse, “jumped—that’s when more than one person attacks you at the same time,” Barrett says. In high school in Jamaica, Queens, Barrett’s grades began to drop—a drop that nearly 20 years later, he recalls with nerdish precision. “I started off with a 90 average, and by my junior year, it was 75.” It wasn’t that the work became difficult. “I neglected school in order to fit in,” he says. He wasn’t even sure he was going to bother with college. But he recalls a life-changing incident at his after-school job at a local supermarket. chemical engineering and becoming a Ronald E. McNair Scholar. Shortly after his graduation, he was hired by Intel and sent to Ireland for training. “I was promoted into management, where I managed a small staff. I was doing very well,” he says. At the prospect of getting transferred far from his East Coast home, however, Barrett changed course, toward a career in finance. After earning an MBA at MIT’s Sloan School of Management, Barrett entered investment banking . Barrett launched Kool Nerd Clothing with his own money, and has started on a small scale. He’s initiated partnerships with institutions such as the Chicago Museum of Science and Industry’s Black Creativity program, and the Amani Public Charter School in Mt. 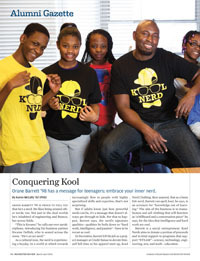 Vernon, N.Y.
At the Amani School, which serves grades five through eight, Kool Nerd Clothing sponsored an essay contest, in which Barrett provided winners Kool Nerd T-shirts and gift cards to Barnes & Noble Booksellers. “What we do closely aligns with Kool Nerds,” says Ann-Marie Ditta, director of development and community engagement for the school. When Barrett met with the students, “It was just amazing how they were totally engaged,” she says. Since Barrett left investment banking to devote himself full time to Kool Nerds, the business has entered a new phase. Everything up until then—the initial batch of T-shirts, the company website and Facebook page—had been part of what’s called in the business world a proof-of-concept launch. “I did not expect the response to be as positive as it was,” Barrett says. With the help of Delfish and Melanie Isaac, who is in charge of marketing, Barrett is working to attract investors. This year, he’ll be taking Kool Nerds Clothing to trade shows, and seeking investors and manufacturing contracts in Los Angeles, New York, and Toronto. The company is also preparing to relaunch its website and social media presence. Meanwhile, Barrett continues to visit schools. In February, he took his message to high school students in Rochester, as well as to first-generation University undergraduates, speaking to them at an event sponsored by the David T. Kearns Center for Leadership and Diversity in Arts, Sciences & Engineering. “Just to have that kind of impact is something I really enjoy and hope this brand can start to do,” Barrett says.